Dr. Nelson showing Patricia an implant-supported denture. 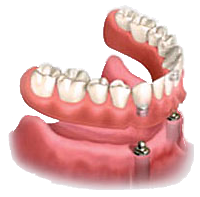 The traditional denture is a removable dental plate functioning as a substitute for teeth. Over the years, denture technology has been greatly improved. New materials and better ways to fit dentures are at hand. There are now different fastening methods that make dentures secure and feel and act a lot more like natural teeth. There are many options available for people who need dentures or are uncomfortable with their current set. Our highly knowledgeable team can provide comfortable, well-fitting dentures that give you a stable bite, a natural look and a more comfortable fit than other types of dentures. If you already have dentures and are tired of problems with them slipping or shifting when you talk or eat, we highly recommend having them retrofitted to work with dental implants. Using as little as two dental implants per arch, your dentures can be made more stable. The more implants used, the greater the stability and natural appearance of the dentures. This means a lifestyle with restored chewing power and increased confidence in smiling and speaking. With enough implants per arch, we can do away with the bulky false palate that covers the roof of your mouth. This allows for more comfort and improved eating and speaking. Why use dental implants to stabilize your dentures? One of the biggest problems with dentures is bone loss, due to the lack of jaw bone stimulation formerly provided by chewing. Not only is this unhealthy, but it can cause the face to sag, making one appear older than they are. Dentures can also become loose after a while, requiring repeated adjustments and even causing sore spots. This is in addition to such common complaints as slippage and an inability to chew certain foods. With dentures that are anchored securely in the mouth with implants, you can eat just about anything you want. Chewing with implants preserves bone tissue and helps keep it healthy. Slippage is no longer a problem and your mouth looks and feels more natural. Full dentures require that all teeth be removed and plates fitted over your gums. These are held in place with a denture adhesive. Traditional partial dentures are held in place by metal clasps that go around existing teeth to secure the partial dentures in place. With flexible, translucent no-metal partials, no one will notice you’re wearing a partial denture. These are placed immediately after your teeth are extracted so you can leave our office with an aesthetically pleasing, comfortable, temporary denture while your gums heal prior to a permanent denture being placed. Implant-supported dentures are dentures that snap securely onto implanted devices in the gums and can be removed by you or the dentist for cleaning and maintenance. We’re qualified in the several varieties of implant-supported dentures and can help you choose the right one. Dr. Roe can take your existing dentures and retrofit them to snap onto dental implants. We take care of relines and repairs in-office and have our own denture lab for more complicated repairs and relines.